Dr Marc's Blog: What's In A Title? When I used to do a lot of piano teaching, I would spend a great deal of time on sight-reading. Partly this was because I, myself, am (or was) a very good sight-reader and really enjoyed it, but largely because pianists are notoriously bad at it; so many regard it as an onerous examination task rather than a vital musical skill. I would tell my students that before they even looked at a note of the music they should study the title. I sometimes went so far as to suggest that, armed with the title, the tempo marking ,the expression markings, the time signature and the tonality, you could have a pretty fair idea of what the piece was going to be like without even looking at the minutiae of the notes. Titles, I would tell my students, were the key to a composer’s intentions. Now that I seem to have moved away from instrumental teaching and spend my days philosophising about music – trying to decipher what music is, why it exists, why people write and perform it, how we relate to it as both performers and listeners, and how best to respond to it so that we can appreciate its true purpose and the composer’s real intentions – I often find myself pondering over the significance of titles. And I am not sure that the advice I gave my poor piano pupils was entirely sound. Pianists are unusually fortunate in that so much of their repertory has descriptive titles which do, indeed, open the door to an appreciation of the music’s character. Even where titles seem routine or formulaic – like Sonata in G, Prelude in C minor, Piece in D – to those who understand, the titles still yield a great deal of information. For certain composers and in certain western musical cultures, tonality assumes great significance, implying a specific mood or character, while words like Sonata, Prelude and Piece often have very clear implications on purpose and design. However, a real danger of titles is to assume they were given by the composer in the first place. 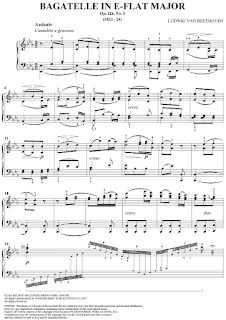 A classic example lies in the keyboard music of Domenico Scarlatti. He would be hugely surprised to learn that he had composed 555 “Sonatas” when in fact what he had written were Essercizi. With his true title, we recognise the purpose of these pieces – for private use in developing technical facility – while with the incorrect title, we think he intended them as substantial works for public consumption. It’s not just a semantic issue, the wrong title can lead to serious mis-interpretations of the music itself. Not helped by Ralph Kirkpatrick who argued quite convincingly in 1953 that Scarlatti designed them in pairs or in groups of three, I have come across countless people who should have known better, believe them to be substantial works, precursors of the “Romantic” Sonata, rather than small intimate finger exercises. 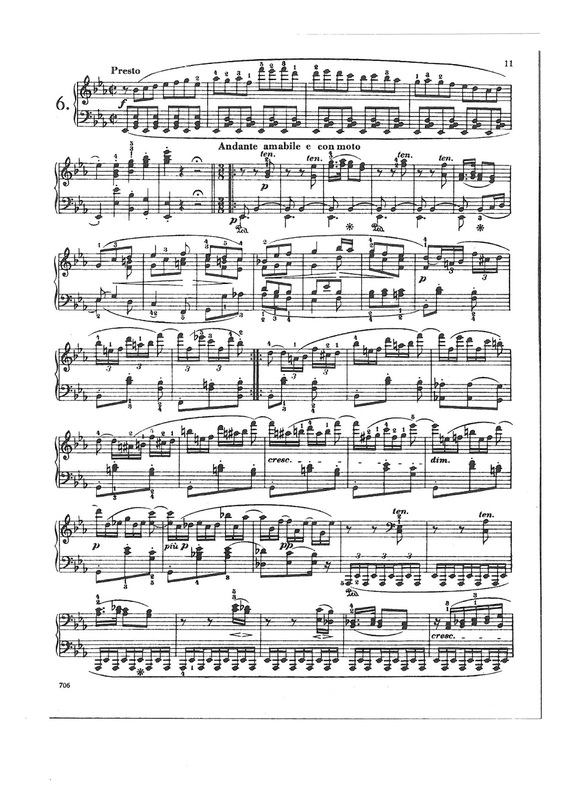 I even read a detailed analysis of Scarlatti Sonatas contorting them to fit into the theoretical concept of “Sonata Form” (a form which was only codified in the 19th century and certainly utterly alien to composers on the Iberian Peninsula in the early 18th century). By combining “Sonatas” following the Kirkpatrick thesis, this misguided soul had shown how Scarlatti, unbeknownst to himself, had devised a clear, tonally organised Exposition, Development, Recapitulation and Coda. The result was so totally alien to Scarlatti’s intention and style as to be an insult to those who have a relationship with the music. The Scarlatti issue is indicative of a problem which I realise is more widespread than I ever appreciated as a piano teacher. How legitimate are titles? We tend to assume, unthinkingly, that composers always put a title on their music; I will often ask a living composer about their choice of title for their music. But many of the titles we associate with specific works had nothing whatsoever to do with the composer. There are obvious ones like Beethoven’s “Moonlight” Sonata, but many more which slip under the radar. What about Beethoven’s Bagatelles, for example? “Bagatelle” finds itself in music dictionaries usually defined as “a short, inconsequential, light piece”. The implication is that it is a specific musical term and that Beethoven used it in the full consciousness of its interpretative implications. Certainly it is a title we associate almost exclusively with Beethoven (as we do “Nocturne” with John Field, “Mazurka” with Chopin, “Romanze” with Schumann, “Humoresque” with Dvořák and “Intermezzo” with Brahms), although we first find it a century earlier in French keyboard. 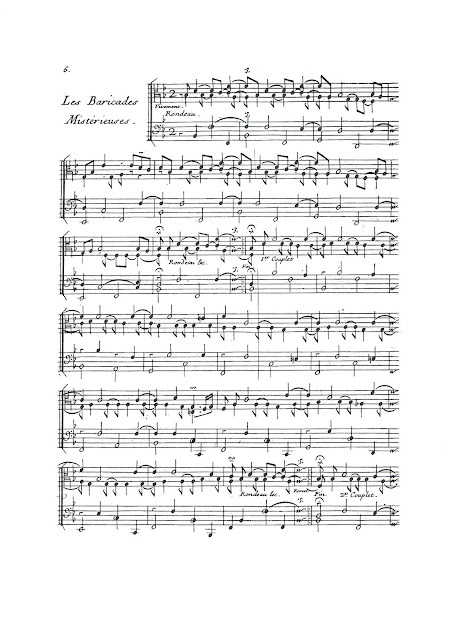 And here we must pause to recognise the invaluable work François Couperin did in elevating the title from generic to specific in his L’Art de toucher le clavecin of 1716, the first major tutor on keyboard playing ever to have been published. In what seems like an extraordinarily perceptive bit of innovation, he realised that young pupils would more readily respond to music with a title vividly describing the mood and character of the piece than through the implications of its tonality, so many of his instructional pieces carry evocative titles. It is in his 1717 publication of more keyboard exercises that we find a piece called Les bagatelles. But was explaining the music’s meaning for young players really Couperin’s intention? 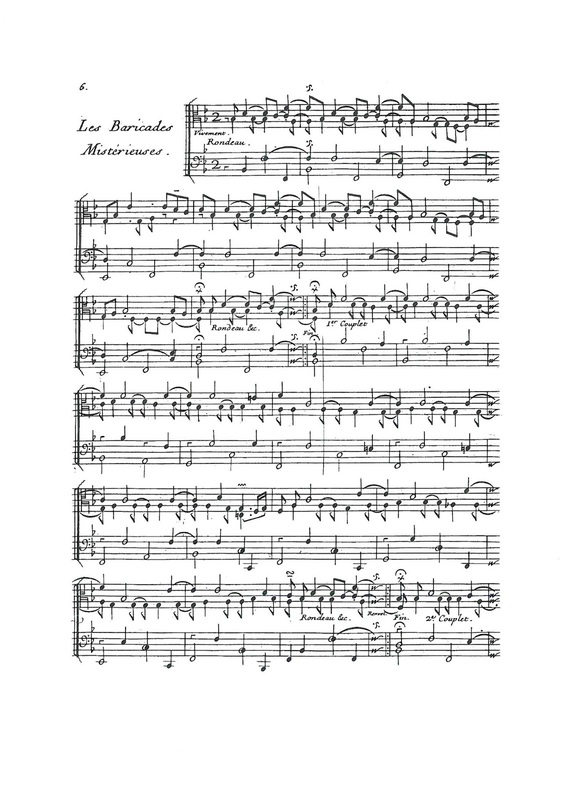 As Angela Hewitt wrote in a piece she penned for The Guardian back in 2003, not all of Couperin’s titles were as obvious as they might at first seem; “I have found internet chatrooms discussing the various possibilities of [Les Baricades Mistérieuses]: some think it alludes to the player's two hands ‘barricaded’ in the lower half of the keyboard, a recent book by Jane Clark and Derek Connon says it has something to do with a divertissement called Le Mystère played to relieve a duchess's insomnia. I have even heard it explained as ‘ladies' underwear’ or, to be more precise, ‘chastity belt’. Couperin left no clues and asked to be forgiven for not explaining”. 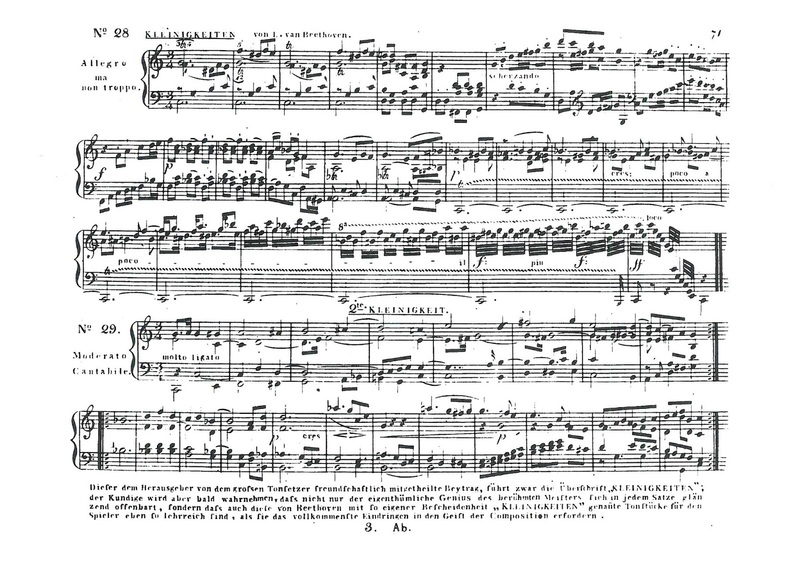 To return to Beethoven and the Bagatelle, he wrote 24 which appeared in three groups published during his lifetime. The first was a group of seven published in 1803 as his Op.33. Obviously they had been written at various times before then as stand-alone pieces. One of them Beethoven claimed actually dated back to 1783, when he would have been just 12. Some have suggested that is unlikely, but we know that Beethoven was something of a child prodigy; it’s just that, unlike Mozart, Beethoven’s prodigiousness has been eclipsed by his maturity. 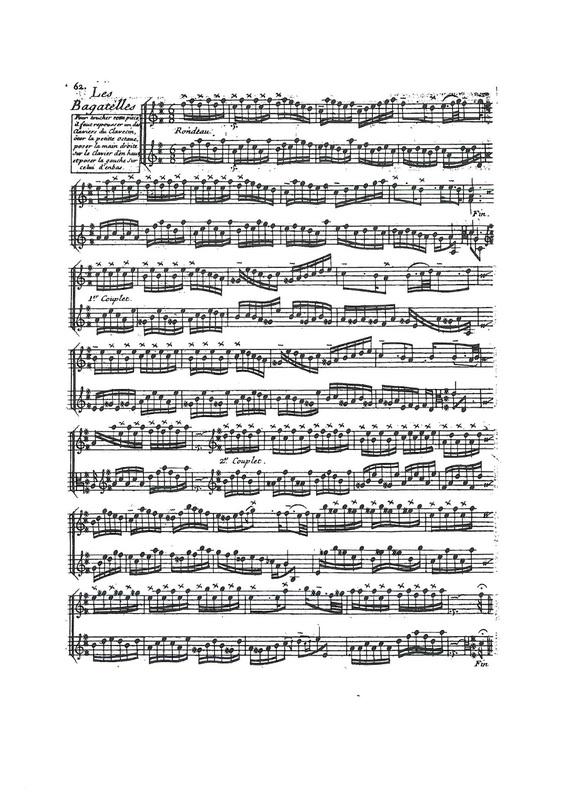 The next was a group of 11 which appeared in print in 1823 as Op.119, again dating back over a period of years, the earliest piece dating from 1794. 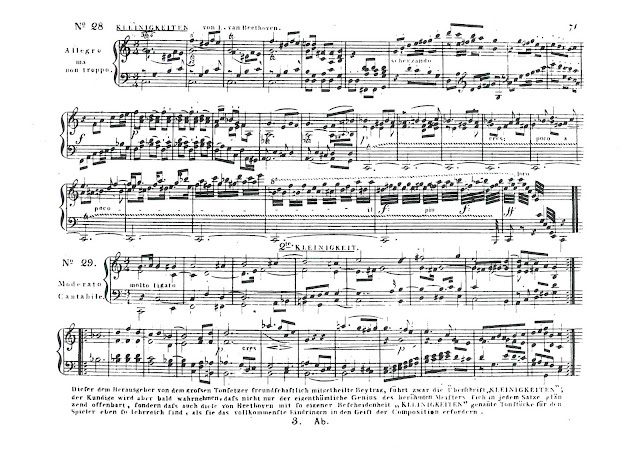 Five of these had been written for the Viennese Piano School published in 1820 by Friedrich Starke, and were rejected by the publisher Peters as being too simple. 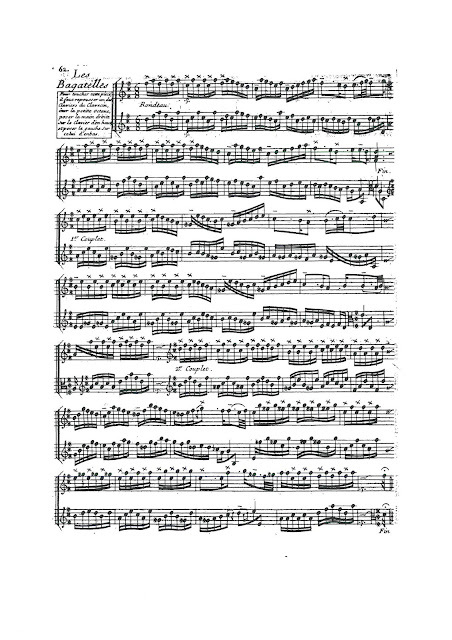 From this we can draw the conclusion that for Beethoven, the title “Bagatelle” meant short, simple, inconsequential pieces, and implied immaturity of invention and technique. He himself used the German title Kleinigkeiten (which is usually translated as “trifles”), so “Bagatelles” seems close enough to his intention. But what, then, are we to make of the six Bagatelles published in 1825 as his Op.126, his last numbered composition for solo piano? They are certainly quite short and none lasts much over 4 minutes. But not only are they recent compositions, wholly typically of late Beethoven (the Beethoven of the Ninth Symphony, the Late Quartets and the Grosse Fuga) but they are quite complex. More than that, they were conceived as a set, not as stand-alone compositions. Beethoven certainly did not use the title because he considered them trifles – he actually described them as “quite the best pieces of their kind that I have written”. Nor did he use the title to imply any sense of immaturity. So the question has to be, why did Beethoven call them Bagatelles? There are, as I see it, two possible answers. First, he did not give them the title, but it was applied by his publisher on the grounds that they were not Sonatas nor sets of variations – the two extended solo piano genres with which Beethoven was most closely associated - and that the public associated Beethoven and simple piano pieces with the name “Bagatelle”. On a purely commercial basis, they would sell as “Bagatelles” even if, once the purchase had been made, the purchaser realised they were not Bagatelles at all. The second answer is less palatable to us, but more likely. It may be that Beethoven simply did not care about titles, and could think of no better label to apply to a group of six individual pieces. 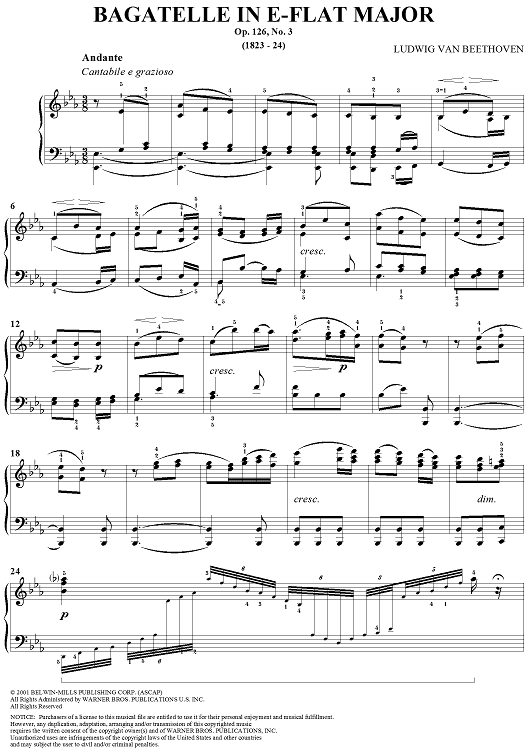 In either case, to use the title as a guide in interpreting the music’s character, scale and scope and the composer’s intentions would be wrong. Even more puzzling is Brahms and the Intermezzo. He wrote 18 of them, the earliest in 1871 as part of his Op.76, but the majority are contained in four consecutive publications which appeared as opp. 116,117, 118 and 119 between 1891 and 1893, which were Brahms’s final piano works. 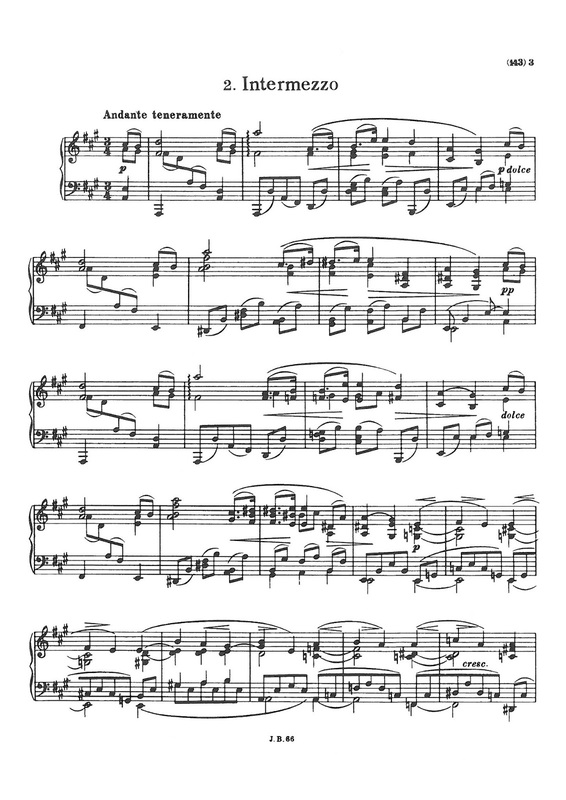 So in an interesting parallel to Beethoven whose Bagatelles were associated with youth and immaturity, Brahms’s Intermezzi are associated with old age. It would be nice to define Brahms’s use of the title Intermezzo as being a reflective, retrospective, nostalgic work; and those who play the Op.118 no. 2 could be forgiven for using that idea as their interpretative guide. But what did Brahms really mean by the title? Its origins lie in opera, where it was used to indicate a short scene or mini-comic opera performed between the acts of a bigger opera. (Richard Strauss famously wrote an entire opera called Intermezzo, using the title for its comic allusions.) But opera and the comic are two things we most certainly do not associate with Brahms, and it seems perverse that he should have used a title with such implications for a piano solo piece with such serious intent. Philipp Spitta, the 19th century German music scholar, wrote to Brahms after reading through the Op.118 set; “They are the most varied of all your piano pieces and perhaps the most rich in content and depth of meaning. Ideally they are to be absorbed slowly and in silence and solitude, and they are appropriate not only for meditative afterthought but also for contemplative forethought. I believe that I have understood you correctly when I suggest this is what you meant by the term Intermezzo“. Let us not forget that Spitta was a leading exponent of the concept of Hermeneutics, much in vogue in 19th century German musical scholarship, in which abstract concepts were interpreted by descriptive analogies, and it would seem that we have to take his interpretation of Brahms’s use of “Intermezzo” more as a piece of fanciful imagination than a dispassionate definition. If Spitta is being more fanciful than realistic, what are we to make of Brahms’ use of the title Intermezzo with so many of his later piano pieces? 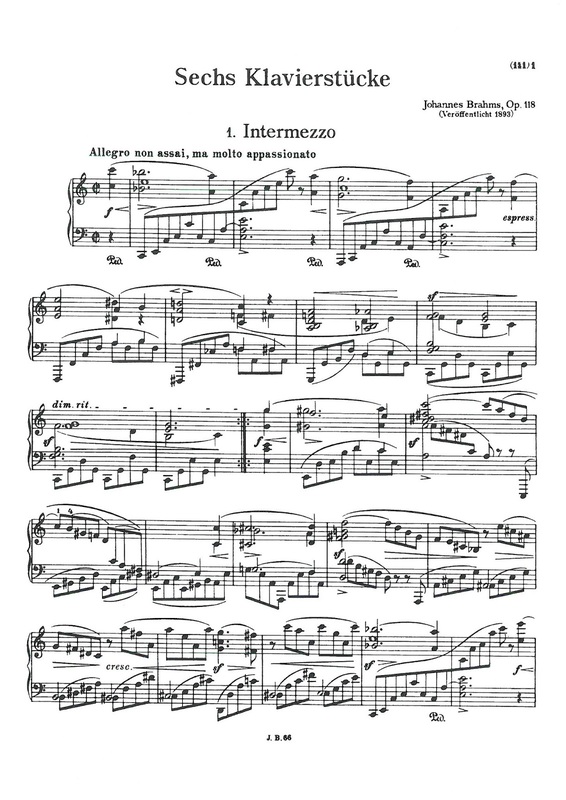 When he presented the Op.76 set to his publisher, Brahms had been unable to think of a suitable title and asked for suggestions, and the publisher suggested “Intermezzo”. In this case, the Intermezzi did indeed come between other works in the same set. But why that title? 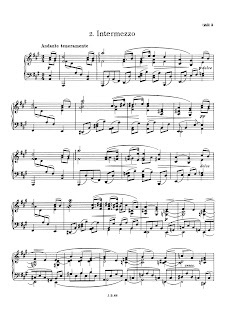 It had only been used for the first time in purely instrumental music a few years earlier (by Mendelssohn) and to that point nobody had written a piano solo piece with the title. Publishers are not known for having original ideas, preferring to attract customers on the basis that familiarity attracts. 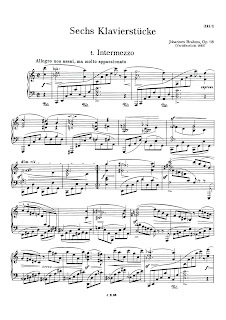 Where and how the original idea of calling piano pieces Intermezzi came about is still a matter of conjecture, but the reason why Brahms continued to use it even when the pieces he called Intermezzi had moved far beyond the characters displayed in the original ones is, sadly, horribly prosaic. A simple look through Brahms’s work list will reveal that he had no interest in titles, generally restricting himself to the general and formulaic; Sonata, Waltz, Rhapsody. It seems that, having come across a new title, he simply did not think to come up with anything more appropriate. For Brahms, titles meant nothing; should we persuade young pianists needing guidance for sight reading that he was wrong? Competitions - A Parallel Universe?